Over forecasting demand can lead to overbuilding with depressed prices for generators and higher than necessary costs to fewer than anticipated customers to pay for underutilized transmission and distribution. Underbuilding can expose loads to high energy costs, congestion on the transmission system and increased costs associated with power outages or curtailments. However, a review of load growth from 2005 to 2016 shows that forecasting demand is not an easy task. 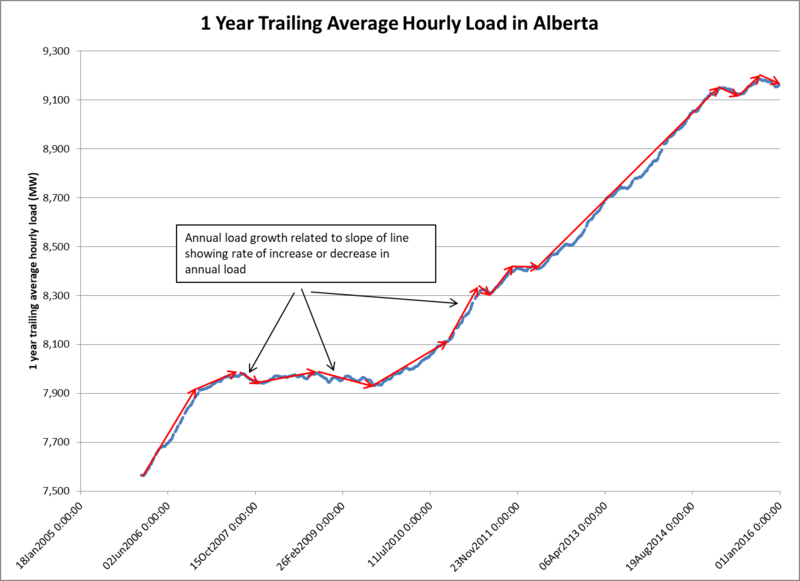 The moving average of annual energy load shows just how variable load growth has been. The rate of load growth is related to the slope of the line at any point in such a graph. As can readily be seen in the graph below the slope has been high, low, and even negative in the past. It is well known that using rates of change in the past to predict future values is prone to amplifying errors. The problem is even more difficult when we realize that over the longer term growth rates themselves may be changing in general. If growth is slowing then forecasts based on historical growth rates will always over forecast growth. Conversely if growth is increasing forecasts based on historical growth rates will under forecast growth. Anticipating the rate at which growth rates are changing is taking the derivative of a derivative and further amplifies errors. It is also a common observation that all forecasts are wrong. The future rarely if ever turns out as forecast. This points to the importance of anticipating how far wrong a forecast can be. With high uncertainty the range of possible outcomes can become large over relatively short time frames. Even attempts to anticipate a range of scenarios can fail to capture the full range of outcomes. In the past the AESO has tried to anticipate a high , low and mid range load growth forecast. In some instances the realized load has fallen outside of even these bounds. How can investors or system planners respond? Recognizing the uncertainty and anticipating an appropriate range of scenarios is important. Another approach is to make plans that emphasize maintaining optionality and delaying decisions until some of the uncertainty is resolved. Reducing the lead times for transmission or generation development would go a long way to resolving risk associated with uncertainty. In times of low growth in demand reducing the size of incremental additions of generation or transmission capacity makes sense. In times of heightened uncertainty scalable solutions are attractive. Changes in technology may be helping in making smaller additions of generation capacity that can be favorably located in shorter time frames economically attractive. The future is anything but clear. But uncertainty places a value on flexibility to respond to a range of outcomes.